To Ellavore on the "Ships starting with E" page. Source for all pics: Bjørn Milde's postscard collection. When war broke out in Norway on Apr. 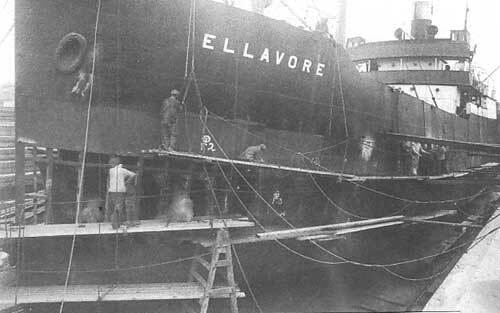 9-1940, Ellavore was on her way from Bordeaux to Port Talbot. A. Hague has included her in Convoy FS 165, departing Tyne on May 7-1940, arriving Southend on the 9th. The Norwegian Balzac is also listed. (Ellavore proceeded to Caen). On June 2, she's said to have left Tyne in Convoy FS 186 and arrived Southend on June 4. This time, the Norwegian Bomma had been in company. Both these convoys are available at the external website that I've linked to below (please be aware that they may be incomplete). According to the archive document, Ellavore had sailed from Leith on June 1 and was bound for Rouen, where she arrived June 6. Convoy FS 165 - The site also has information on FS 186. 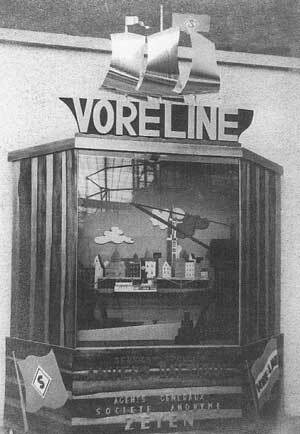 Ellavore got caught in Rouen, France after the German invasion in June-1940. As mentioned above, she had arrived Rouen on June 6, managed to get out on June 8, then anchored up for the night off Corvette that evening. Early the following morning she had to continue further down the Seine because the oil stores at Corvette were set on fire. Late that afternoon a patrol boat came alongside informing them that they were to go to Le Havre the next morning, June 10. (This means she was there at the same time as my father's ship, D/S Ringulv, which evacuated close to 1500 refugees from Le Havre, under constant bombardment - more in my father's letter No. 2 and No. 4 under Odd's letters, and on my page Evacuation). That same evening Ellavore was hit by a bomb which went through Hatch No. 3, the explosion lifting her out of the water and causing her to sink by the stern when water gushed in. The crew managed to get across to a French vessel right next to her (SNA 9). 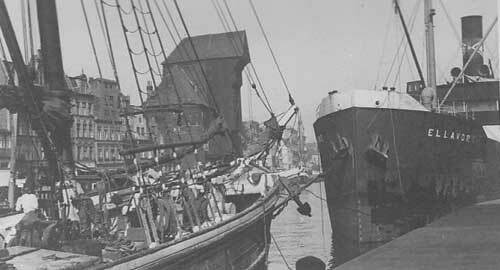 In order to prevent her from sinking alongside the quay and blocking the traffic, she was towed to the other side of the harbour with the help of the French ship. The captain, the 2 mates and some of the other crew members were subsequently able to borrow a lifeboat from the Norwegian D/S Diana to get to their ship to see what could be done, and to salvage supplies and equipment. However, efforts to save her were abandoned, partly due to the chaotic circumstances in the harbour at the time. Her entire complement was accommodated on board the Norwegian D/S Lotos. The following day they again borrowed the lifeboat and the mates and some crew went back to Ellavore to pick up some of her provisions, as there was nothing to be had on shore. They were also able to get one of the lifeboats. On June 12, 2 of Ellavore's crew, Trimmer B. Trønnes and Deck Boy H. Hansen signed on D/S Diana which was in need of men, and went with her to the U.K. The remaining crew was given passage on Lotos, which arrived Swansea on June 20. Ellavore's crew continued to Cardiff that evening, where most of them were accommodated at the Scandinavian Seamen's House. The maritime hearings were held in Cardiff on June 24-1940 with the captain, the 1st mate, the 2nd mate and Able Seaman Gulovsen appearing. Upon departure Rouen on June 8, Ordinary Seaman A. Skoie and Jr. Ordinary Seaman A. Søderlund were ashore and had not returned in time for departure, so they are not included in this list. *Peder Gullowsen's subsequent ships are listed on this page, while the 1st mate's ships can be found on this page (both links are external - his name is a little different at this site). Refloated on May 12-1947, broken up in 1948. Back to Ellavore on the "Ships starting with E" page.